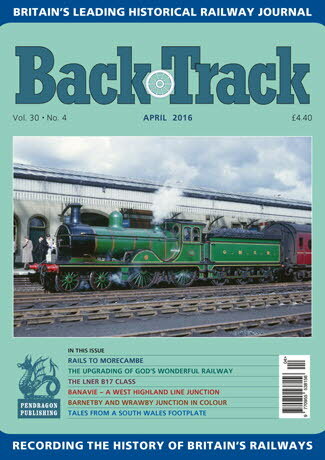 Railway Magazine | BackTrack April 2016 journal from Pendragon Publishing. Scottish Rambling - David Idles's colour spread on the 'Scottish Rambler' weekend tours of the mid-1960s. Railways to Morecambe - David Joy describes the development of the Lancashire resort and its railways - and their decline. The Upgrading of God's Wonderful Railway - Jeffrey Wells describes how the GWR created a more direct route to the west early in the 20th Century. 'The Nearest Run Thing' - Part Two - Geoffrey Skelsey discusses the decline and revival of Marylebone station and its Suburban Services. Signalled through Barnetby and Wrawby Junction - colour celebration of the now replaced semaphore signalling installations in Lincolnshire. The Railway in Court: Mind the Gap - Bill Taylor looks at some legal cases involving platform accidents. Cheltenham and Gloucester - colour photos of both in the early 1960s. The Smithy Wood Branch - Chris Booth looks back at a South Yorkshire goods operation as it was in the 1970s/80s. Banavie - A West Highland line station, junction, pier and bridge described by David Stirling. To Crewe for Repairs - colour shots of two locos at the works for attention. A Different Class The LNER B17s - George Smith presents a personal take on the B17 'Footballers'. Tales from a South Wales Footplate - Some footplate recollections by Tom McCarthy from his time as a fireman at Ebbw Junction shed, Newport.